Firing twin barrels of arena-rock muscle and moving melodies, Greta Van Fleet is a modern rock & roll band rooted in the genre's strongest traditions: super-sized hooks, raw riffage and the sweeping vocals of a front man who was born to wail. The four-piece formed in Frakenmuth, Michigan, just outside of Detroit, where 20 year-old twin brothers Josh and Jake Kiszka began playing shows with their 17 year-old younger brother, Sam, and 17 year-old family friend Danny Wagner. Holding their practices in the Kiszka family garage and road-testing their songs onstage throughout Michigan, the four became a band of brothers whose songs mix classic chops with the thrill of teenage angst. From sing-along choruses to fiery guitar solos, Greta Van Fleet rounds up a highlight reel of rock & roll heroics. These guys aren't revivalists; they're looking ahead, breathing new life into a sound that's blasted out of car dashboards and living room stereos for decades. 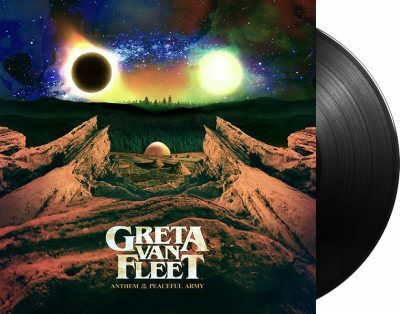 Album Review: Greta Van Fleet - "Anthem Of The Peaceful Army"